This series was inspired by one of my favorite places on earth, Ocracoke Island, North Carolina. The photos are originals that I took there this summer. 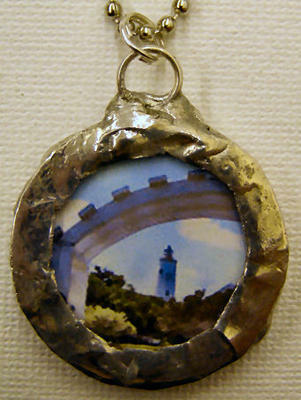 On the front, a view of the Ocracoke Lighthouse through a garden arch. On the back, one of Ocracoke's peaceful creeks. This piece can be worn either way. I sandwiched my photos between 1.5 inch round pieces of glass, I then soldered them with lead-free silver solder. The jump ring is sterling silver, and a 24" steel ball chain is included. These works are one-of-a-kind originals. I've made each by hand, and no two are alike. I love the rough industial feel of the solder that makes each one unique. The round shape gives the feel of a porthole, and I like that as well. Please see the next image to view the back of this piece.